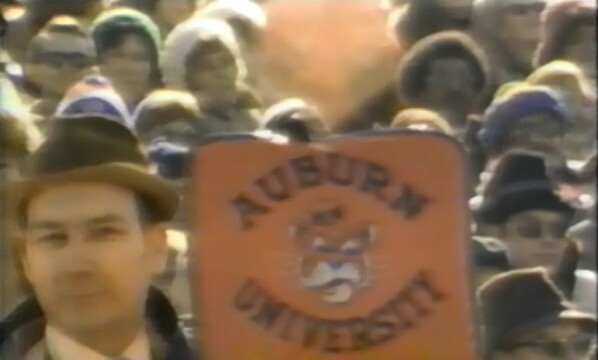 Was an Auburn fan photobombing broadcasts of other teams’ games in the 1970s? Remember the Rainbow Man? Well, Auburn may have once had a Rainbow Man. Only instead of John 3:16 signs (and kidnapping charges), he was holding up Auburn seat cushions and promoting the gospel of Shug. 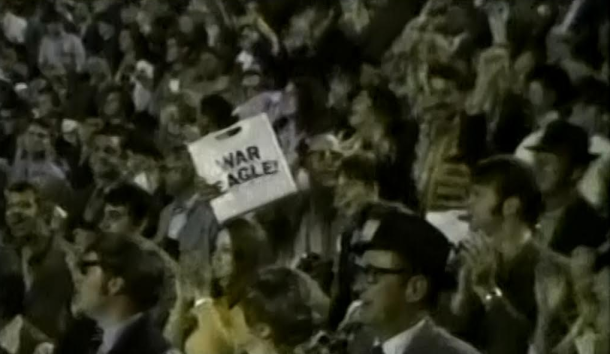 Or at least it seems like the guy our old pal Allen Spain spotted holding up a “War Eagle” seat cushion in ABC’s broadcast of the 1970 Ole Miss-LSU game, and the guy he found holding up the Auburn seat cushion during the broadcast of the 1976 Alabama-Notre Dame game we told you about a couple of years back certainly seem like they could be the same stud. And not just because of their identical heroic habits. There’s the similarly shaped head. And 1976 Auburn Man could easily be bald under that hat, just like 1970 Auburn Man appears to be. Sure, it looks like 1970 Auburn Man is wearing glasses, but guess what Bausch & Lomb unveiled in 1971? THE FIRST FDA-APPROVED SOFT CONTACT LENSES. Oh, and course, the guy in each of these screen grabs is directing his myopic peepers directly at you. Like Rick “Rainbow Man” Rollen, he’s watching (as best he can) the cameras, not the game. They pan past him. He stands up and deliberately flashes cushion. It could be nothing. It could be a coincidence. It could be some sort of Washington State flag relay type thing. Or it could be the same guy, not just in spirit—in the flesh. Come forward. Tell us your story. If history is any indication, TWER is your best shot at a 30 for 30.